This racy-looking filly is by Darby Dan’s sire sensation SHACKLEFORD, Three-time G1 winner of over $3 million, leading money-winning 3-year-old of his crop, winner of the Preakness (G1), Met Mile (G1), Clark H. (G1), and the Churchill Downs S. (G2) on his way to becoming an Eclipse finalist as both Champion Three-Year-Old and Champion Sprinter. 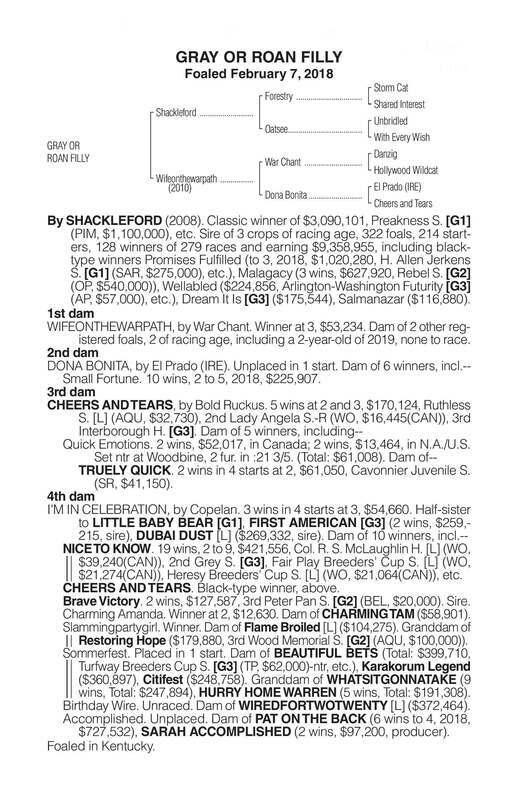 Now as a sire he looks to be even better: SHACKLEFORD was a leading Freshman Sire in 2016 and the only Freshman Sire in 2016 to sire two TDN Rising Stars. The next year he was the #1 Second-Crop Sire by winners and Top 3 Second-Crop Sire of 2017 led by MALAGACY, winner of the Rebel S. (G2), and DREAM IT IS, undefeated two-year-old filly and 9-length winner of the Schuylerville S. (G3). And the momentum continued as a leading Third Crop Sire in 2018 with 9 stakes horses led by the co-fastest three-year-old of 2018 inPROMISES FULFILLED(107 Beyer), winner of H. Allen Jerkens S. (G1), the Phoenix S. (G2) against elders, the Fountain of Youth S. (G2) and Amsterdam S. (G3), G3 winner PRINCESS SOPHIA (TRI), stakes winners SALMANAZAR and WELLABLED, stakes-placed DREAM IT IS, Angel at War, Excessivespending, Ms Meshak, Friday, Kenai Bob, etc. SHACKLEFORD is hot at the sales too, with 2018 yearling sales up to $200k and two-year-olds commanding $295k, $250k, $250k, $200k, $170k, $170k, $150k, $100k, etc. 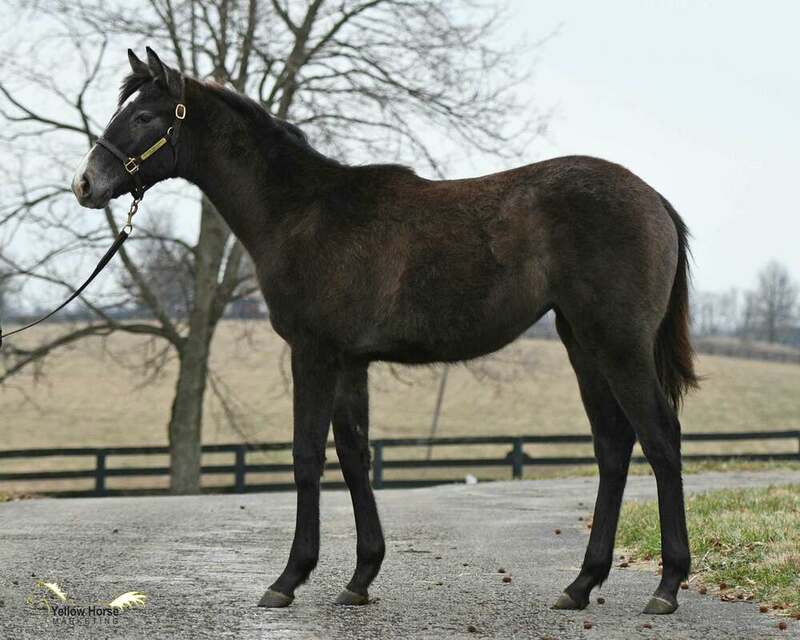 This lovely filly is just the third foal out of the young race-winning WAR CHANTmare WIFEONTHEWARPATH, who has both an ARTIE SCHILLERjust-turned 3-year-old and a MUCHO MACHO MAN2-year-old coming for her!